Why superheroes, and why now? The obvious answer involves film technology – previous to the CGI era, it was just too difficult to make superheroes plausible. What can be done for the cost of four-color printing and some line art on the page takes millions of dollars and incredible technical skill onscreen. Technology is clearly a factor (it is also, I think, why good horror movies are so much rarer now – it was impossible to show everything in the years of yester, so far less was shown – imaginations were employed). Now anything imaginable can be made plausible. But even with that hurdle jumped, the rise of the superhero film wasn’t inevitable; it is only a small part of a larger cultural movement. All of geek culture, formerly the home of the misfit, has been mainstreamed. Adults loving cartoons and legos and unashamedly, unironically embracing the artifacts of their youth is commonplace. The people who grew up playing video games and caring about Transformers kept doing it as they became adults1, and meant it. Part of the appeal, of geek culture and superheroes specifically, is a sense of identity. A superhero knows who he is, it’s right there in his name. 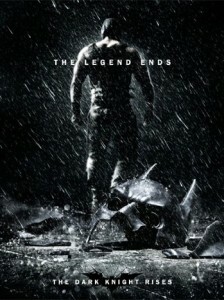 The two biggest movies of the year to date have been The Avengers and The Dark Knight Rises. In some way, the contest is a recapitulation of what occurred in 2008, when Iron Man and The Dark Knight became the two biggest comic-book movies of all time (all time does not last long). They were opposite applications of the comic-book ideal – Iron Man was all character and fun, while The Dark Knight used broad, operatic identities to explore Big Issues. The Dark Knight Rises follows much the same pattern as The Dark Knight, turning its characters into Great Men Embodying Big Ideas. It is more ambitious, and where it falters it does so because its ambition sometimes outstrips its story sense. Above all, however, The Dark Knight Rises is Big. It bangs, it explodes. Every line of dialogue is not about characters expressing their individuality, but about Talking About Things with a capital T.
After The Dark Knight, Bruce Wayne has retired from Batting about, and so has retired from life. After some vaguely described accident (which I could never quite tell if it was supposed to have really happened, or if it was a cover story), Bruce Wayne spends his time isolated and weird, escaping from the very society he helped to preserve. Laws that passed in the wake of Harvey Dent’s death have allowed the police to cripple organized crime, and save Gotham from itself. That storm is Bane. Bane’s character design tips so much to the absurd that it is hard to believe he works onscreen. The face-obscuring mask, the big furry coat – Bane ought to be ridiculous. But his implacable facelessness and guttural voice are imposing, and eerily plausible. He never smiles, frowns, curses or gets angry. He is the pure embodiment of Anarchist Revenge. Bane’s costume is the inverse of Batman’s. The only part of Batman’s body that is visible is his mouth and jaw. All the rest is hidden in plastic and metal and black. Bane bares his arms, and occasionally his entire chest. His mouth and jaw are invariably covered by his mask. While Batman’s voice is unobstructed, he is often silent. Despite his plans and his muscle, Bane’s main weapon is his voice. Muffled, but oddly intelligible. Batman’s vulnerability is about controlled potential. He can speak, but only his actions matter. Bane, after locking up Gotham’s police and killing its leadership, unleashes a reign of anarchy on the city. There’s a bomb that’s going to blow up. There’s kangaroo courts and a resistance movement made up of the few cops who weren’t locked away. Batman’s back is broken, and he is locked in a subterranean prison from which he must…what’s the title? The Dark Knight Rises, even more than The Dark Knight, is an opera. Its characters are broad, enormous Symbols, and the set-pieces do not follow logic as much as they do emotional need. Sure, Bane’s attack on the stock exchange appears to begin at high noon, but it also marks the re-introduction of Batman to Gotham, which must take place at night. So, it becomes night. Selina Kyle’s class warrior is directly confronted by her desire for an anarchist uprising in stark terms, when she learns how uncreative destruction can be. There are Lessons! Things mean Things! And it can all be a bit weighty for a story about people in costumes fighting improbable fights. Thematically, The Avengers may be about how teams are formed, and what separates a good guy from a bad guy2, but it does it primarily in order to show you, the audience, cool people doing cool things. Hulk smash. 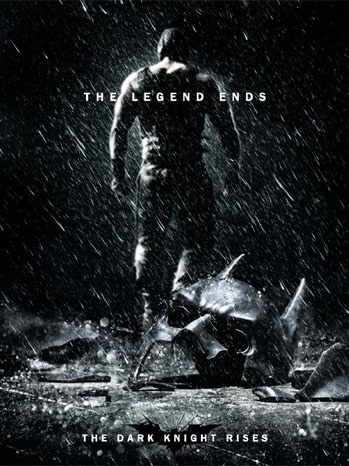 The strength of this movie, then, depends on how much you want a Batman movie to be about Things. I do, plenty, and so liked it. Though I had thematic issues with how the actual nuclear threat was dealt with throughout the film, the resolution was moving and charming. Director Chris Nolan knows how to push buttons, and how to bring a pretty damn good series to an escalating climax without either collapsing under ambition, or scaling down the ambition as would a more meager talent. Batman is violent justice tempered by restraint. Bane is anarchic desire unrestrained. Catwoman is immature rebellion facing real world consequences. Commissioner Gordon is the face of compromise. Blake is unwavering faith. Each character in the film has an ironclad, unshakable identity, a part they have to play and one they either understand, or come to understand as they grow. The comic-book movie offers a kind of promise that life’s ambiguities are something that can be overcome if we understand ourselves and our role in life. It may or may not be true, but it is attractive. 1I was going to say matured, but I think it is debatable whether maintaining these old affections has a retarding effect on personal maturity. I have problems with that notion, but haven’t given it enough thought to dismiss it out of hand. As an aside, I do believe it is just as ill-considered and reactionary to dismiss potential negative effects of pop-culture usage as it is to assume that adult pop-culture fans are man-children. It is disingenuous to claim that media has no effect on an individual when it can occupy so much of an individual’s thoughts, hopes, and dreams. These are complicated and important subjects to consider and debate, and personal defensiveness should hold no sway in the argument. 2From that perspective the best scene in the movie is when, after the military secret weapon program is discovered, Nick Fury actually offers a cogent defense of making big world-destructy things that go boom. No po-faced shame, but a reasonable “Damn straight we’re gonna make super-weapons. We might have to fight Gods.” It would be irresponsible for a government not to create the capability to face great threats, and The Avengers understands that.